Bank of America (BAC) stock most likely to collapse. The stock of a humongous American bank, Bank of America (BAC), is collapsing. This is stoking fears that Bank of America will go bust, taking the whole economy down with it. Why is Bank of America's stock tanking? 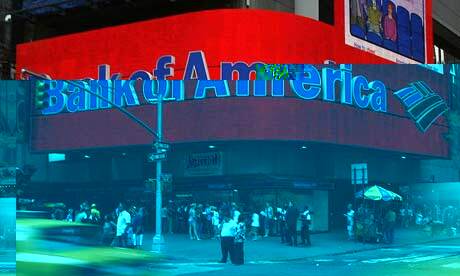 Because the market thinks Bank of America is worth much less than Bank of America's management says it is. In fact, in what is fast becoming a formal law of bank-stock thermo-dynamics, the more the bank insists that everything's fine, the more investors take this as a signal to run for the hills. And given that Bank of America has now persuasively broken the $7 barrier and now has a mere $65 billion of equity value left, this death spiral can't continue much longer. (The good news, I suppose, is that the stock can't fall below zero). Today, after I wrote a blog post in which I described a few asset categories that Bank of America observers are skeptical about, Bank of America once again defended itself (by attacking me and saying the figures I had relayed were wrong). But the stock still dropped another ~4%. This begs the question: How solvent is Bank of America, anyway? Will the government have to step in again and bail it out? NYU finance professor Viral Acharya, the author of Guaranteed to Fail, says that Bank of America is the most vulnerable of the major banks, as well as the most "systemically risky." He thinks it's possible that, under some economic scenarios, Bank of America will need more capital, as described in the accompanying video. He also thinks the government should analyze its books, perform another round of stress-tests, and, if necessary, re-capitalize it.